This has some minor changes from the original. There is a ch5 space at both ends (sometimes I do a ch4 instead), and ch2 instead of ch3 for the corners. And go across with 3dc in the spaces between each group of 3dc of the previous round. Now you are at the last ch5 loop ready to make more corners. Slpst to the top ch of the ch2 that started this round. Ch2 to begin the next round (this counts as the 1st stitch). 3dc in between the 3dc’s of the previous round. If you want to continue in the same color you would repeat the last 2 rounds. If you want, you can do each round in a different color, or change colors whenever you want. Simply end off at the end of a round and start the next round by attaching a new color. Begin the same ending with ch5, slpst in the same ch as the last 3dc, and then end off. Attach your new color in the space between any group of 3dc. You can slpst and ch2, or you can use a standing stitch as I did here. Continue around making corners in the ch5 loops as above. Slpst to the top of the first stitch and you are done with that round. End off to start another color. Another version, this one is different. I wanted one for when I want to make my rectangles the 3dc, ch1 way. Having 3 ch’s between each 3dc clusters in the foundation chain seemed a bit too roomy, so I did this instead. I haven’t made anything with this yet, so I don’t know how it will hold up with larger items, but it seems to be a nice and neat option for starting rectangles. The beginning is different, but once that is done the only difference is doing ch1 between the 3dc’s, so this is very brief. Continue like that, you will end with a dc in each of the last 3 ch’s. Ch3 (counts as the first stitch), 2dc in the ch1 sp. If working in the same color, you repeat rounds 2 & 3. If changing colors you end off and attach a new color as above. Here is this version done with a different color for the 2nd round. You can see how it is worked into the ch1 spaces on either side. I’m wanting to use the Version 3.1 to make a temperature journal blanket for my baby — with the centre row 21″ long — how long is your centre based on ch27 start? sorry, neglected to measure it! I just wanted to say thank you. The instructions are really easy to follow and I’ve already made a start on the blanket I want to make for my nephew for Christmas. I have now made 17 of these blankets for charity – it is such a great pattern. I am thinking of making a wide scarf next – could you give me some idea of how long to make my starting chain for a scarf say 120 x 30 cm? I haven’t made a granny scarf yet (it is on my mental list of things to make!). I would probably make a starting chain about as long as felt I wanted the scarf plus a little extra. Then do the first row in the stitch and when it reached the length I liked I would just undo the extra chains. Continue on. I would keep in mind that the scarf would get longer as it gets wider when I decided on the beginning length. Ok, now I really want to make a scarf LOL! I have now made my first scarf! I had a starting chain of 34 motifs which was 74cm long, and ended up with a scarf which is 110 x 36cm after 18 rounds. The same starting chain would have given a 96 x 28cm scarf if I had stopped after 14 rounds. Wonderful! Would love to see it! I’ll blog it soon and send you a link! In the mean time you can see the granny rectangle blankets here: https://iamsimplyhooked.wordpress.com/category/baby-blankets/. Thanks for the inspiration…. I am definitely putting a granny scarf on my to do soon list! Thank you thank you thank you! I much prefer this starting method, and you’ve written it up so clearly. Started my blanket last night. 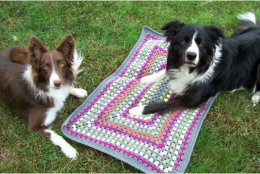 Thank you for sharing this pattern…How many chains would it take to start a 48″x 60″ blanket? Thank you. I haven’t worked out the starting ch for different sized blankets. You would want your beginning (the first row as in the first photo) to measure about 12″. That should give you a rectangle that is about 12″ longer than wide, or at least it seems to work out that way for me. I used the 3.1 pattern for my first ever rectangular granny patterned anything. I made a shawl for a friend while on holidays this summer and it turned out beautifully. Making another asap. Thanks for the instructions and the very helpful diagram. I have made regular Granny Square afghans, but do like the rectangular look too. I have a LOT of acrylic yarn in a tangled mess from my mom, so as I untangle I can make blocks. Thank you so much for a fun looking pattern. This is exactly what I need for my Grandma’s Christmas gift! Thanks! Is there a program you use for creating the diagrams? Is there a way to print this where we won’t end up with 20 pages, i.e., just the instructions? No comments, no pictures, etc. Tks. I don’t have a printable pdf. You could copy the text you want and paste it into a document. Copy the website address, go to http://www.printfriendly.com, paste it in the box, and hit the button. Voila, printable pattern! Couldn’t get any easier. Thanks so much for sharing that site; I’ll save a fortune in ink! I’ll be putting it in every crochet/yarn bag I have!!! Love it. Made one when I was younger, but no longer had pattern. Thank you very much. I thank you so very much! I was looking for a way to make a nice rug in a rectangular shape that I could use mandala like colors in and you’ve provided a way to do that in a very easy to understand way. I’m going to be able to use this in many ways. I’m so excited! AHHHH!!!! THANK YOU! Your pattern looks more solid than any other rectangle pattern. I’ve tried other patterns before but it always felt to flimsy to me (and I have a tight tension). I will be eagerly trying your pattern (one my arm is out of the cast). This will be great for fingerless gloves- just do the rectangle until it’s big enough for your hands, then join the left and right sides, leaving a hole for the thumb! Going to try it now! I have been using your V3.1 and so far used a whole skein of Caron One Pound. The yard is a medium weight and recommends a “H” hook, but I have been using a “I” hook for my project. While I really like the revisions you have made, I am having some issues that are not major, but annoy me. My sides have developed waves and my corners are leaning to the left and seem to be longer than the sides. I don’t know if you have run into this, or if I am being too picky, but I was hoping that maybe you had a solution or suggestion that might help. When I did a larger project, I found with the 3.1 it got wavy for me too. I think the ch1 between adds too much. I only use that version if I have a need for it, like if I want to join rectangles together with join as you go. For larger rectangles I stick with the 1.2 version. Thanks for the quick reply. I was thinking that might be the solution. Now my husband can laugh as he watches me unravel yet another project. Was also thinking that doing 2dc-ch2-2dc in the corners might help too. As always it will be trial and error, it’s just that I hate taking things apart. Love this pattern & this version makes a much nicer looking afghan. Thanks for the pattern. Hi, I have just started crocheting after more than 3 decades. There’s many tutorials that can be viewed and test it, compared to those years, crochet books are the only reference available when you are at the other part of the world. After browsing, I love to try your tutorial. Can’t wait to begin doing it. Thanks and appreciate your sharing. I absolutely love this pattern. I really love the look of the rectangles but I’m having trouble connecting them. What join did you use? And any tips would be helpful. Thank you so much for the post. I haven’t (yet) made anything with rectangles that I connected. You can use any method you like. I like the join as you go (search this site) for many things, but it depends on the look you want. There are some links to other kinds of joins under “interesting articles” in the right hand column. I do the same as granny squares, no turning. But it is your crochet work, so you could try that if you want. I’ve forgotten: Your first version is great but your second version is perfect! Best rectangle pattern I’ve found! Thank you so so so so much! I love this pattern! You did an excellent job with the directions and the pics. My afghan is about a third of the way through and I really enjoy making things pattern. Thanks so much! I haven’t made a quilt out of smaller rectangles. I have made some throws by making one big rectangle.